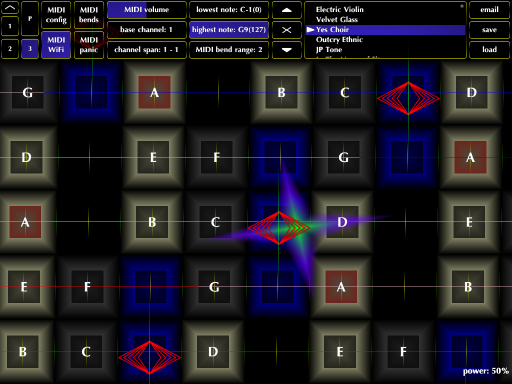 GeoSynth now supports Audiobus! It’s been a really long wait, but it’s finally become far more useful. Geo has been a fine midi controller, but was stymied by having no significant updates for ages. 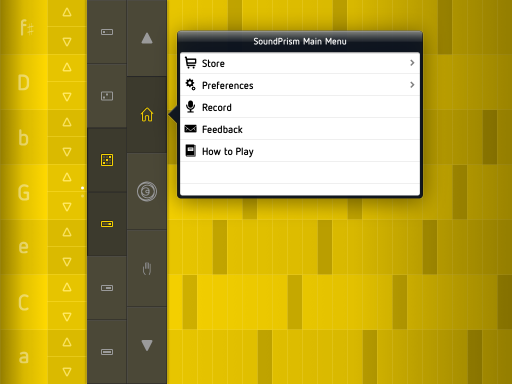 That’s over, and GeoSynth joins the ranks of the best and most useful music apps. It’s been one helluva push forward for new iOS music apps and Virtual Core MIDI recently. The technology is really a happy accident of sorts. Developers are exploiting some electronic doorways to create a feature that allows us to have MIDI controllers on our iDevices that control other apps running in the background on the same device. Cool huh? No more wires needed. Of course the standard wired MIDI support is featured for those who still enjoy being tethered to their external hardware. GeoSynth is the latest to exploit the Virtual Core MIDI feature (VMC), and brings us probably the most unique of virtual MIDI instruments with a very logical and colorful interface. Easily one of the more expressive playing surfaces that can be configured to fit your playing styles. A lot of attention went in to GeoSynth to be a premiere live performance instrument utilizing the touch surfaces of which ever iOS device you prefer. It’s hard to not feel like you’re playing a futuristic instrument from Blade Runner or something. Tapping and or dragging your happy fingers on the cells and anywhere in between, and exploring the wicked pitch bendy responses between notes makes for a grand time. It’s truly a spectacular instrument, and way too much fun to play! 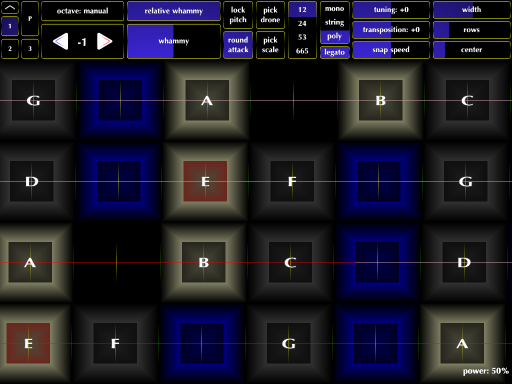 GeoSynth features many of Jordan Rudess’ custom sounds. The team really chose some very cool sounds for the 40 presets covering a fairly wide range of moods and flair. If you aren’t satisfied with those, well, it’s a MIDI instrument so go get your own. No problem. I’ve been enjoying all the presets offered, and exploring Geo as a VCM controller for Arctic Keys running in the background on my iPad1. Very cool, but I found that my iPad1 is grossly under powered. The quality of the experience diminished in result. However with some careful tweaking of the settings, and trying to not do too much all at once, I was able to enjoy the pleasures of VCM, and Arctic was able to record my brief session which I then was able to copy and paste elsewhere. Which brings me to my next point, and serious gripe. Being such a technological advance that Geo is, taking great advantage of the newest wireless capabilities as well as supporting standard MIDI connectivity, there is NO recording, or audio copy paste? To me, it’s a glaring omission that defies logic. I might even call it a blunder. It’s quite baffling to have such an advanced virtual instrument that plays and sounds so damn amazing, but utterly fails to include the most fundamental of expected iOS music app features: record, and ACP. To be fair if you are already hooked up to an external set up or whatever, don’t care about mobility, and love your cables then rock on, this is perfect for you. For the rest of us, this lack of basic sharing many of us have come to expect renders the instrument inert. More or less a very cool toy. I did email Wizdom Music and asked, WTFrak? I received a very nice response from customer support that, and this isn’t a quote, but for sake of being brief boils down to this; development is ongoing, there always remains the possibility of additional features being added to satisfy users. Vague, but not a hopeless response. Whatever the case is for the future of GeoSynth, and no matter it’s present day offerings, it IS a very nice, highly entertaining virtual instrument with huge possibilities. Geo is ground breaking, and loaded with easy to use, high quality features. You’ll find a nice long reverb, stereo delay, gain control, octave, adjustable 5th harmonics synthesis, easy connectivity to SampleWiz accessing its waveforms, attack, release controls, and low pass filter with resonance. There’s a lot that GeoSynth offers. It does exactly what it says it does, exceeding my expectations as a MIDI instrument that is insanely fun to play! This is perfect for live performances, and is highly responsive to user input on the fly. GeoSynth is too cool to pass up. Be patient. If you’re like me and feel a tad maligned by its lack of basic recording and audio copy paste features, I believe it’s a safe bet they will address this soon. Fingers crossed. 3 Stars for folks like me who are entirely wireless, waiting for Recording and ACP. 5 Stars for those wrapped in wires, and not concerned with mobility. I thought it curious that despite the developer comments, GeoSynth updates have not been err…updated. What the flip? * Previously I had entered a lot of my own opinion in this updated review. It turned into some rant. Really I should not have. This is a review not an OpEd. I also suggested this is of no use as anything but a MIDI controller. That was stupid. Of course its used very well as a controller. That’s what it is after all. I made the wrong point while I was displeased with the lack of progress. Sorry to my dear readers for that absurd comment. My point was to suggest that having this developed a bit more for a wider range of uses and convenience is what has been lacking. It doesn’t desperately need Audiobus as whatever it controls (Such as virtual midi) sends the audio from its AB input to record in whatever output. Its just a bit of a hassle not being able to start the recording from within Geo. I would be more forgiving if it hadn’t been so very long without any significant updates. The issue that I failed to express concern for was about trusting further development. Geo is a great controller. One of the coolest around. The question really is, should it be bought considering its not seen any significant developments for over a year? Part of what I weigh my recommendations on is trust. I think that is important. That said, and despite how much I like Geo, I can’t honestly recommend it as is. ACP was spurned, then offered as an expected compromise, then forgotten. Audiobus has arrived ending the AudioCopy/Paste debate, and (Thank God!) the need. Will GeoSynth ever grow? BeepStreet hasn’t updated iSequence in a while, and it has worried me a little bit. There’s still no Audiobus support for this. I saw a post recently from BeepStreet that more or less explained the situation. This isn’t an exact quote but he said that the reason for iSequence not being updated in some time was due to his interest in synthesis like Sunrizer, and Impaktor. Both excellent instruments no doubt. He went on to say that he is going to return to his roots and develop a new app based on iSequence. Don’t get too excited yet, but yeah it is exciting. He is waiting for iOS 7 to arrive so he can take advantage of the new app audio connectivity. Now that’s interesting. That leaves me to suspect that if he is going to wait for iOS 7 to do something new, but similar to iSequence, that Audiobus is not coming to this app any time soon. Does that mean iSequence is dead? I really hope not. It sounds to me like he intends to use the new iOS 7 features to accomplish the same things Audiobus does now. Either way, you won’t be streaming iSequence audio to any other recording app any time soon. None of this changes the fact that this is a fantastic sequencer, but you’ll have to be OK with only having the AudioCopy/Paste option for a while longer. iSequence has been around a while, as far as iOS music apps are concerned anyway. I’ve had my eye on it for just as long. Now that I have it, I regret not getting it sooner. This really would have made my life much easier if I had not waited so long. Well it’s never too late to add a great tool to the toolbox. Tablet in this case. A short list of features follow. 8 tracks, 32 steps pattern sequencer, max 999 patterns, real time recording, 5 configurable FX slots (Live Looper is really fun) including Reverb, Delay, Distortion and more. 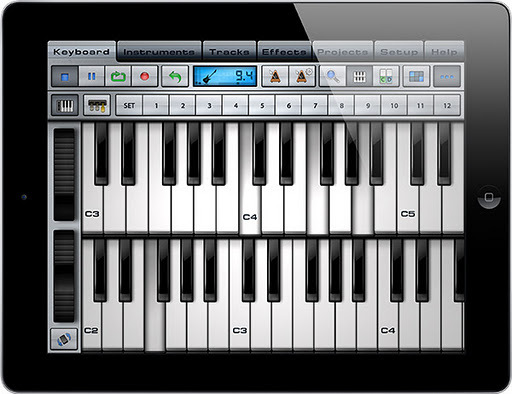 Automation, FX curves editor, 165 built in instruments (more banks available via IAP), Sampler with wave editor, 6 octave piano keyboard, and drum pads. Copy Paste between compatible apps, WiFi sharing: HSQ, MIDI .Wav and HSQ import. Support for core MIDI and MIDI instruments. Whew! There are many more. That’s just the short list, the number of features, are quite numerous. With all these functions, and features in a sequencer this loaded, you might think its going to be a cumbersome work flow with lots of confusing sections or screens to move between? Or not, in any case iSequence does manage to make excellent use of the iPad screen providing a very nice work flow and just 3 main buttons to tap for maneuvering among primary screens. Sampler, Curves, and Mixer. It’s a nice, simple, detailed interface that frees users from overly complicated menus, or hidden functions, and lets the creative process flow naturally. Among all the great capabilities in iSequence I noticed (or failed to notice) that there is no undo/redo function? However in working with the app I didn’t really have a situation that couldn’t be worked out. All in all I find iSequence HD to have a great intuitive design, and user interface that has been a real pleasure to use. I’m sure to put this to a lot of use. I always listen carefully for audio quality, and all I heard was perfectly clear sound. No one should be surprised by that, BeepStreet has proven to really have its eye on the proverbial ball when it comes to quality all around. My first experience with a BeepStreet music app product for iOS was Sunrizer Synth, so my expectations were pretty high, even knowing this came first. 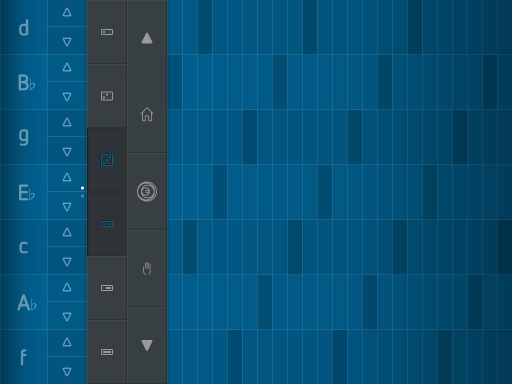 I am very pleased with this sequencer all around. Those new to iOS music might think this will be tough to learn to use, it’s not. Of course there is always a learning curve with something new, but if you have ever used a step sequencer before, that curve will be minimal. No matter what, don’t sweat it. Like I stated before, the design is intuitive, and I might add logical as well. So don’t worry about skill level. There is plenty of support starting with the “Help” button leading to a nicely detailed instruction manual inside the app. You can also often find support in the forum, and direct from the developer if all else fails. Take it easy on him though, he’s a new dad. 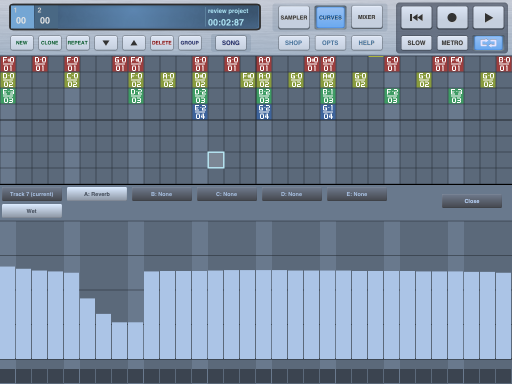 This is a fantastic app, and my new favorite among step type sequencers. I recommend it highly. iSequence HD can be purchased in the iTunes app store. Review based on use with iPad 1, and iPod Touch 3GS. I can’t believe I haven’t reviewed this yet? I use this as much as anything, if not more. 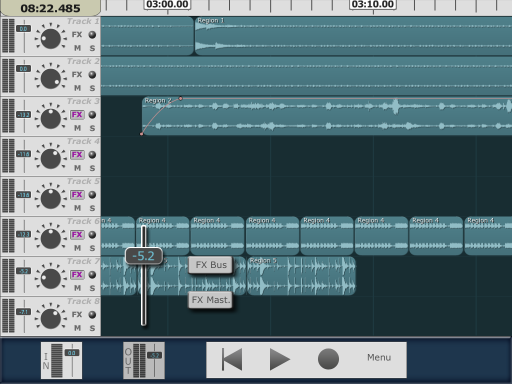 Harmonicdogs, MultiTrack DAW is a serious work horse for the iOS musician. Starting at $9.99 the basic version comes with 8 stereo tracks, there is also an option to upgrade to a total of 24, (via in app purchase of $14.99) there is a lot of room to record and mix complex songs. MT DAW has one of the most clean interfaces I’ve seen on iOS. It’s simple, and intuitive user interface utilizes the best aspects of the multi touch functions to get the job done. No hassle, no fuss, no flash or unnecessary complications. Just a high quality professional, portable audio recording work space. All tracks are stereo 16bit 44.1 kHz CD quality. No clipping, no instability even when using all 24 tracks. Waveforms are nicely displayed in each track and easily edited, or named with a simple touch and drag of the finger. Edits are non destructive so whatever you do in the track to change, split, or fade the waveform, the original file saved safely in the song or shared “Bin” remains unchanged. 30 levels of undo, 40-240 BPM adjustable metronome, various time signatures, looping with markers, move or copy paste multiple regions and bounce down. Open the bin browser to select and preview raw audio files before placing in a track. These really are just a few of MT DAWs features. Recently MultiTrack was updated to include two new adjustable FX! 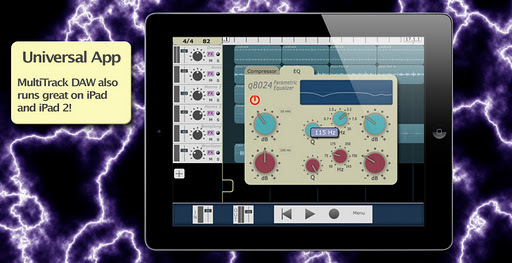 We now have Stereo Delay, and Reverb available via the FX Bus. You can have one FX tab moved in front of the other if you wish to change the order. Reverb is technically “Freeverb” but works very nicely all things considered. 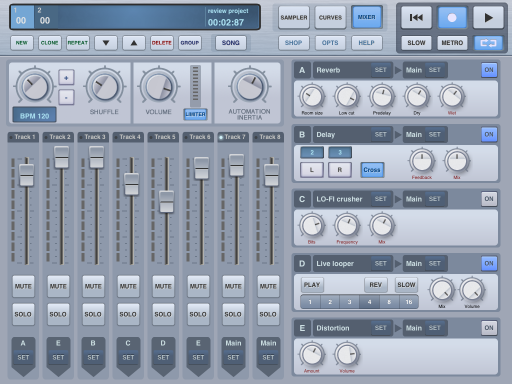 Reverb is not only one of the most used and desirable FX, but also the most demanding on CPUs. Stereo delay is pretty demanding as well, and these demands are why there is only one global FX bus. However the amount of the selected FX can be adjusted at each individual track level from 0-100. The quality of the FX are both quite nice, and it was well worth the wait. With copy paste between compatible apps, there is also iTunes file sharing, additionally there is email attachments and direct upload to Sound Cloud support. Audio can be recorded directly to a track via (depending on your device) internal mic or an iRig and so on. Every aspect of MultiTrack is designed to be easily done. This really goes beyond what some might expect in a mobile recording application. You get a truly professional, powerful, studio quality virtual work environment with no compromises. 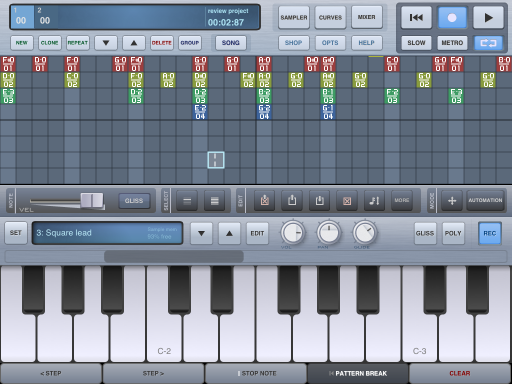 I have found it indispensable in my iOS music work. Now that Delay and Reverb are part of the package, MT DAW is even better. This is one of those music apps that should be in every iOS musicians collection. It’s been one of my most favored “goto” audio recording apps for a long time. It has been long known by so many to be a reliable, stable and an overall outstanding app for mixing together many artists songs world wide, including several of my own (See also on this blog site) songs from my all iOS album. It not the only stereo recorder, but it is the only 24 track stereo recorder, and in my opinion one of the very best. Review based on iPad 1 use. It’s been a long wait, but Xewton delivered on the promises of taking Music Studio to the next level. I have had a love hate experience with Music Studio for a good long while now. I always loved how great it worked, sounded, and looked. I also hated that it had restrictions that prevented it from being fully realized as a truly portable, professional quality music studio. The missing function highest on my list of problems was that it had no audio copy paste support at all. Being an artist who refuses to be tethered to anything, that missing feature was a deal breaker. Well, that is no longer a concern, and audio copy paste is supported to both copy from, and or into Music Studio between compatible apps. I couldn’t be happier, and finally being able to use Music Studio free from the need to be plugged in to anything has just sent me into a tizzy. Okay, enough gushing. How good is Music Studio? Should I buy it? You’re most likely wondering about those things. The short answers for the impatient are, it’s excellent, and YES! The detailed answers are more complex, but end up saying exactly the same thing. So, here’s the meat. You get, 127 tracks, up to (65 free and 60 more via IAP) 125 studio recorded instruments, audio tracks, 5 real time FX including Reverb, Delay and more. MS supports core MIDI, has split keyboards (each can have its own instrument), drum pads, wave form and audio region editing, audio copy paste, and SO much more! There is so much available in Music Studio now. Loads of tools, features, and options to allow just about anyone the freedom to create the music they love practically anywhere they wish with little need for much else. Thankfully with all the new additions, and now that it has ACP, it is in my opinion, complete. No more limits to the sounds you can include in your Music Studio compositions. Bring in those samples, or recorded performances from other synth apps or samplers etc, right away. Gone are the days requiring an annoying pause to plug in to the computer, move files, and sync. Want to record some vocals or live audio? No problem. Plug in your iRig and record strait in to the track. There’s still plenty of hardware support if you need or want it. You can plug in to the Akai Synthstation. There’s support for Apogee Jam, Alesis IO Dock and more! Among the fantastic crisp, clean, crystal clear audio quality, and many features, there’s an improved user interface. Many changes are cosmetic as well as functional, but still just as easy to use as ever. Design of Music Studio did get a face lift offering a new look that still feels familiar, and fosters an uncomplicated virtual work environment. Drawing, quantizing, transpose, split and moving parts, tracks etc, are all a snap. 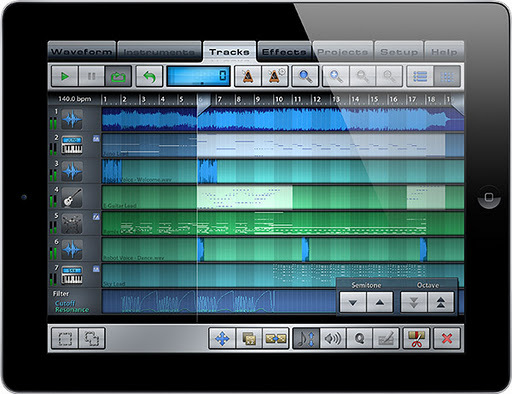 Music Studio could be the most powerful yet intuitive mobile “iDAW” to date. It’s quality is unmatched, and is definitely a fantastic app for those who are ready for a professional quality, feature packed, virtual studio to take their music to the next level. The best part is, you can now do that anywhere you want. It’s been a long wait, and I nearly gave up. I am happy to eat some crow and say Music Studio 2.0 is a must have. 5 stars. No contest, just get it. **Note- At the time this was posted Music Studio had a known glitch in the recorded FX event tracks that caused crashes. Xewton report that an update was in works to correct this.